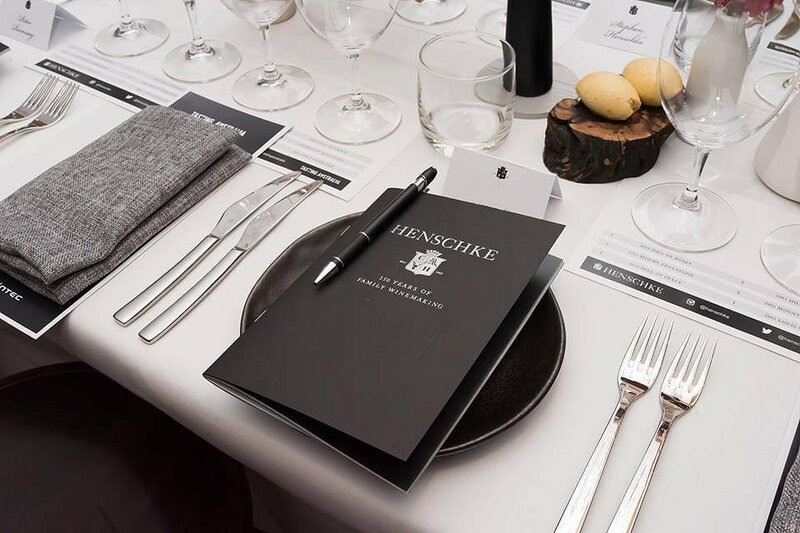 On a cool Autumn Friday evening, a small group of guests were lucky enough to sample two of Henschke’s most sought after and collectible wines in an intimate dinner experience. In a Tasting Australia 2019 exclusive, Henschke presented a preview of 2014 Hill of Grace, 2013 Hill of Roses and 2015 Mount Edelstone wines framed with a suite of museum vintages and matched to a one off collaboration menu by Italian star, Antonia Klugmann and Botanic Gardens Restaurant Chef, Paul Baker. We enjoyed the Hill of Grace 2002 and Mount Edelstone 1992/1999/2006 from the museum, as well as the Hill of Peace Semillon 2014, the only second white release from the Hill of Grace vineyard, Cyril Henschke 2013 and other liquid treasures from the family cellar. Against the background of harvest in their new cellar door, we were also the first to taste Hill of Grace 2019 in the making. An experience in itself that will never be repeated. 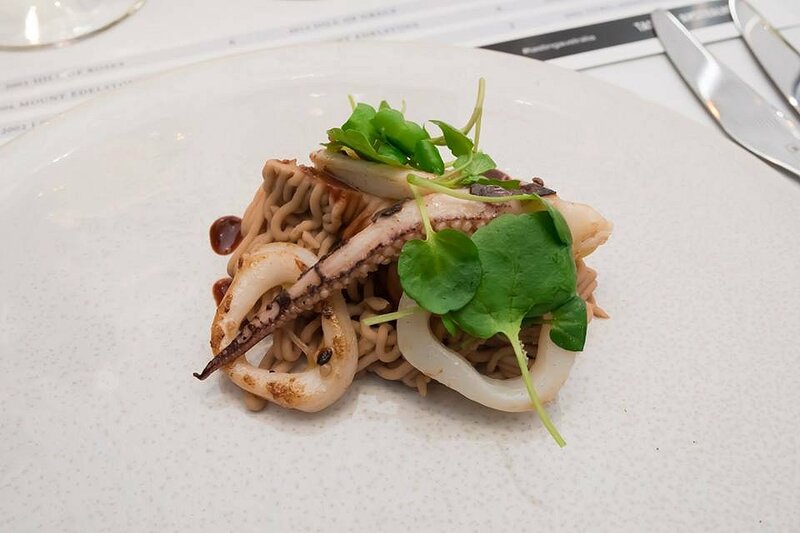 The generous morsels of squid were perfectly cooked. It sat on top of a bed of mashed chestnuts mixed with extra virgin olive oil which gave it a smooth and creamy texture. This was balanced by strands of fresh, leafy watercress. 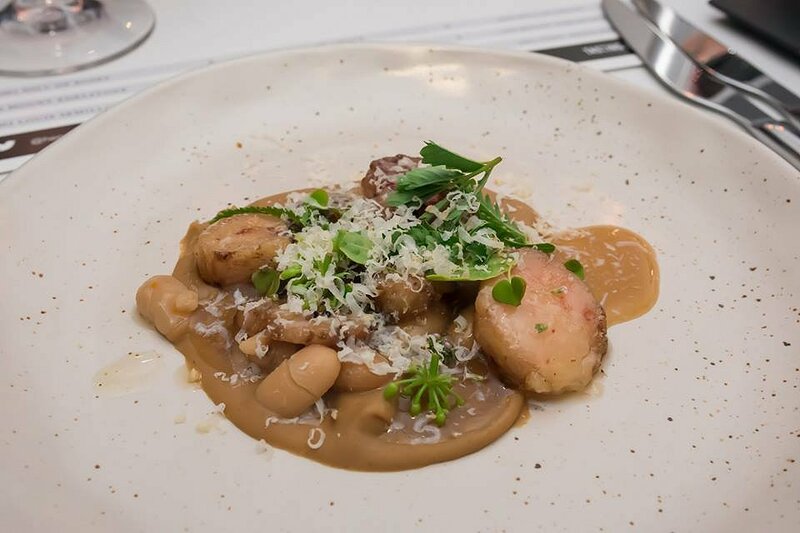 This dish was paired with semillon which had clover blossom aromas, citrus flavours, herbacious notes, and good minerality and acidity. The older semillon had a more prominent flavour of honey on toast. 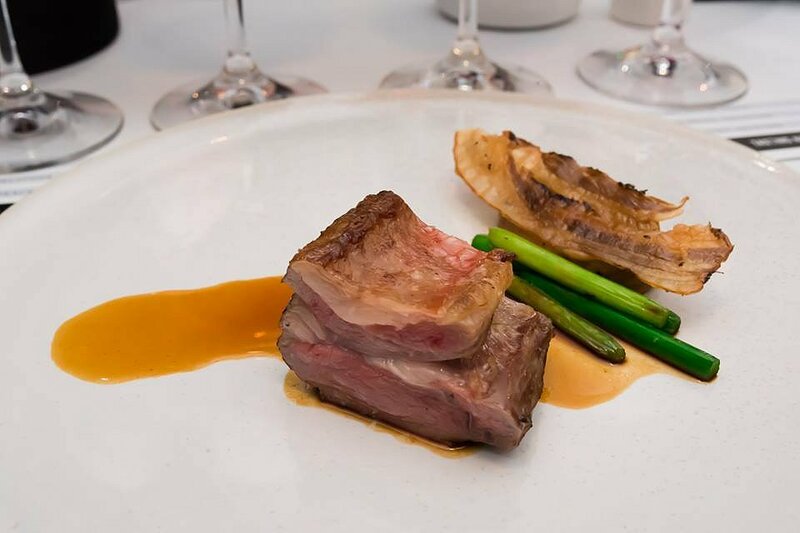 Using ducks bred on apples in the Adelaide Hills, the meat had a much sweeter flavour. A lovely contrast in textures from the crunchy hazelnuts and the leafy chickpea shoots. 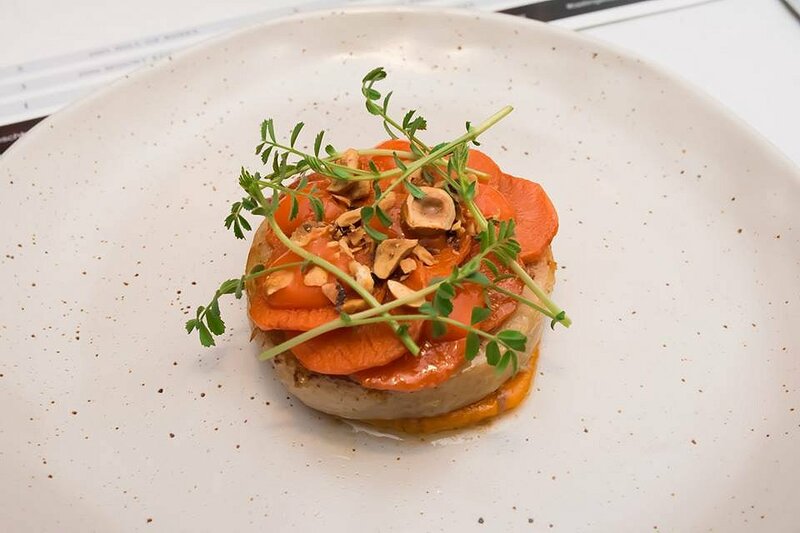 The carrots had smokiness from the cumin and mustard, and its earthiness was balanced by the acidity of fermented cumquat and the richness of the duck. It was paired with two cabernet sauvignon that were fruity in aroma. On the palate, there were various berry flavours complemented by layers of dried herbs, spice, vanilla and cedar. The elegant thread of acidity and fine rolling tanins provided structure and poise. A favourite within the room was the Beetroot Gnocchi. Each gnocchi morsel was soft, pillowy and buttery with natural beetroot flavours. The plums were in the form of firm gelatinous sheets, while the roses added a crunchy and smokey flavour. These were matched with two shiraz that had elegant flavours, beautiful acidity, lovely lines, velvety tannins, and many layers of flavour and complexity. The lamb loin was roasted in lemon myrtle, and wasn’t too strong but good enough to cut through the fat. The thin slices of belly bacon were smoked, rubbed and hung for 4 weeks, to give the dish a nice crispy component. The caramelised cauliflower were cooked for 4 to 5 hours to remove the sugars and get a natural caramelisation. 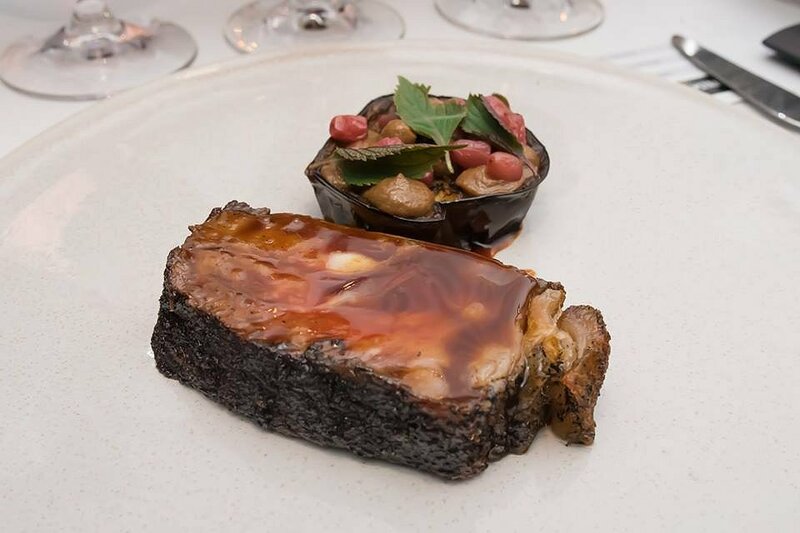 The sweet notes of the cauliflower really complemented the sweetness of the lamb. This was matched with two elegant shiraz that had lovely length and structure. It had beautiful maturity figures and great balance, and all in all, delicious rustic full flavoured wines. The bone marrow was fatty and gelatinous with subtle meaty flavours. The ricotta was both smokey and salty, which balanced the acidity of the pears. The herbs taken from the Botanic Gardens provided a contrast in taste by adding a strong mint flavour. This paired well with the shiraz which had distinct flavours of anise and various kitchen spices. The top of the line strip of beef was crusted in Hill of Grace vine leaves that were dehydrated and toasted. This mimicked the taste of meat being cooked over an open fire. 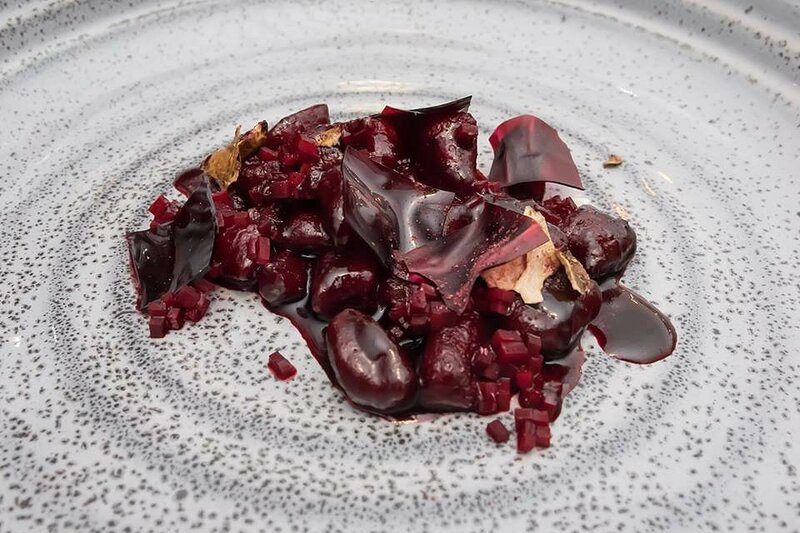 The savoury flavours of the eggplant were balanced by the herbacious riberries and the prominent taste of black garlic. These were matched perfectly with the shiraz which was elegantly structured, vibrant in aroma, and had distinct taste of five spice on the palate. Last but not least, were a selection of petit fours. The marshmallows had a distinct taste of burnt cherries, the pate de fruits were a soft sugar-coated jelly, while our favourite, the salted caramels, were chewy with a hint of vine leaves. These were complemented by the lovely citrus flavours of the semillon. Aged in French oak barrels, the tasty dessert wine was like pure nectar. What an amazing night! 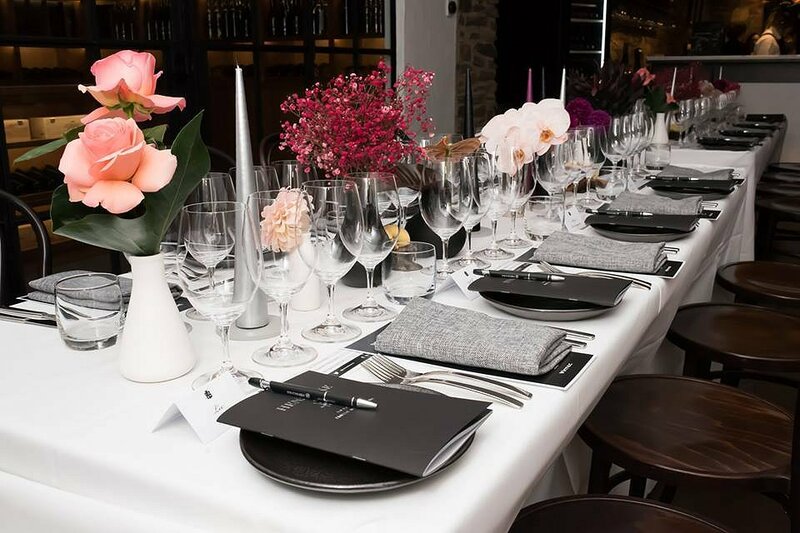 It was a pleasure to be part of a once in a lifetime experience at The Great Henschke Vintage Dinner. Thank you to the Henschke family, Chef Paul Baker, Chef Antonia Klugmann, and all staff involved for creating a truly memorable evening.